So, we’ve gone and done it again. We just topped ourselves as a species for spending cash on various ways to kill each other. According to the Stockholm International Peace Research Institute (SIPRI), global military spending in 2016 rose for the second consecutive year to $1.7 trillion. In case that number doesn’t mean much to you, here’s a little perspective: $1.7 trillion buys around 170,000 private jet airplanes … or 19 million brand new Porsche 911s … or 340 billion pumpkin spiced lattes at Starbucks. 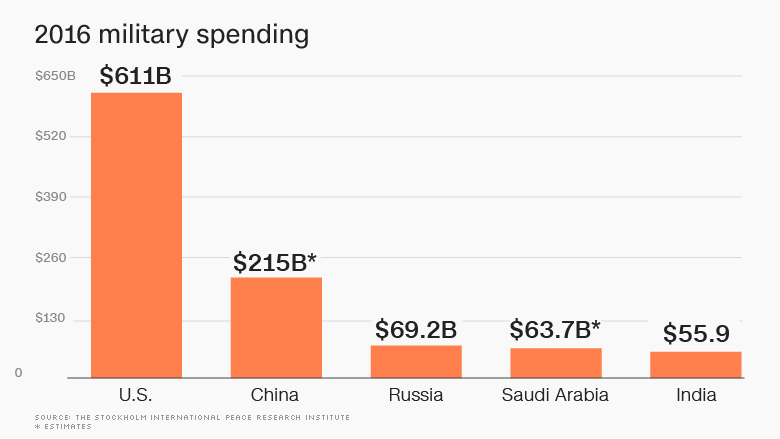 A recent CNN article titled “Russia is Now the World’s Third Largest Military Spender” notes how the former Soviet republic just shot past Saudi Arabia to grab the bronze medal. To taste silver, the Russians, who spent over 5% of their economy last year on guns, ammo, and the like, would need to triple expenditures to catch the Chinese. And both of them are so far behind a certain you-know-who, it’s not even worth trying to catch up. Of course, keep trying, you know they will. Not that I really thought growing up we would be zipping around in jet packs yet (though how cool would that be if we were?). I had hoped the future would hold a little more peace than the present does now. What’s wrong with us humans? I don’t believe this is our fate. I think we’re just stuck, collectively caught in an antiquated way of looking at the world, of seeing what’s possible. I truly believe all of us – well, a good many of us – have the ability to change. We can make better choices. We can learn how to live with each other. And we can make sure our leaders let us. After all, it’s our money. And just think of all the cool things we could be buying with it – like Porsches, or private jets, or maybe even jet packs!